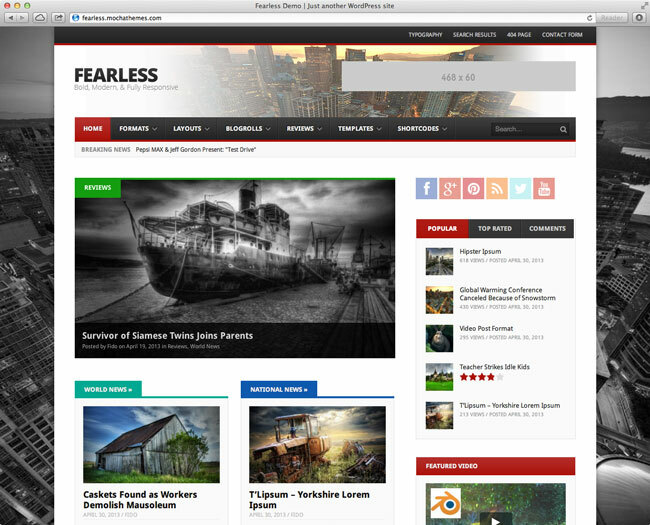 Introducing FEARLESS: A bold, modern, and fully Responsive Premium WordPress Magazine Theme with an amazing array of features. Take your site to the next level with one of the most powerful WordPress magazine themes on the market. Fearless features a modular drag-and-drop homepage layout, multiple blogroll styles, multiple theme layouts, and an incredible number of premium features and custom widgets. Fearless has also been designed to be as easy-to-use as possible, so setup is a breeze. And to top it all off, it’s backed by some of the best support in the industry. No matter what your level of experience, Fearless is the perfect theme to make your site stand out from the crowd. Don’t leave any of your visitors behind. Fearless is fully responsive, and looks great on all kind of devices and screen sizes, all the way from widescreen desktops, down to tiny smartphone displays. On top of that, it’s fully Retina-display ready, so your text and images will look absolutely gorgeous! Building advanced layouts has never been easier. Simply drag-and-drop the included layout widgets to create your own unique, fully responsive modular layouts. In addition to the modular layouts, Fearless includes a total of 5 different blogroll styles. Fearless lets you change the layout style, featured slider, accent color, fullscreen background image, and custom sidebar on a category-by-category basis, giving you complete create freedom for your category pages. Making money from your site just doesn’t get any easier or more convenient! Fearless includes a responsive image ad widget, which allows you to place image ads in any widget area, and your ads will be made responsive, automatically. Showcase your recent or featured posts in gorgeous retina-ready responsive post and category sliders, which are touch-enabled for mobile devices. In addition, gallery-format posts feature Retina responsive featured galleries as well. Fearless is loaded with custom sidebar widgets, 13 in all, and that’s not even counting the homepage layout module widgets! From recent posts with thumbnail images, to popular posts, to top-rated posts, and everything in between, you’ve got all the tools built-in to create a truly custom site. Create a review site using the advanced built-in review system, or turn it off if you don’t need it – it’s your choice! You can specify review criteria three ways: in stars, points, or percentages. Supporting the new and super-cool WordPress Live Theme Customizer, you can preview the various theme settings LIVE! In addition, you can preview your site live with any of the included Google Webfont presets, so you can easily see how the different fonts will look with your content. Fearless comes with lots of options for building social interaction with your visitors. To start with, you can place links to your social profiles in the top bar, in the branded footer widget, and anywhere in your sidebar using the built-in widgets. In addition, Fearless features a vertical floating social sharing bar that allows visitors to post your articles to their various social profiles. Fearless lets you set a global fullscreen background image, and override it on any category page, if desired. With individual sidebar areas for the homepage, posts, pages, and categories, you can easily customize your sidebars for different parts of your site. In addition, you can create your own custom sidebars for any post, page, and category. However, if you don’t need multiple sidebars, you don’t have to use them – we’ve made it easy for you to use only one sidebar across the entire site if you wish. With support for WordPress, Facebook, or Disqus comments, you’ll have the tools built-in to build visitor loyalty and increased interaction. Fearless includes an RTL stylesheet, for support of right-to-left languages such as Arabic and Hebrew. 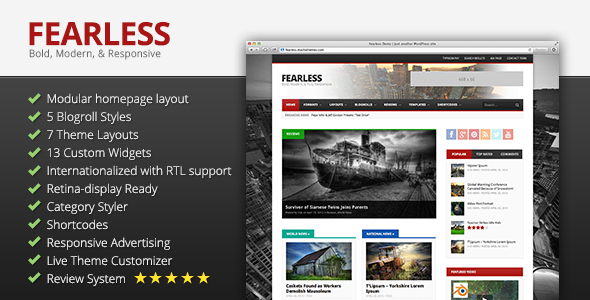 Fearless supports the Standard, Audio, Gallery, and Video post formats, with special styling for each one. Fearless includes all of the shortcodes you would expect from a premium theme, including columns, buttons, tabs, and much more! Fearless’s typography is top-notch. To start with, everything is built on a modular grid based off of the Golden Ratio. Next, we’ve gone through the Google web font directory and chosen the best Google Webfonts. You can preview your font selections live using the WordPress Live Theme Customizer, and you can have different fonts for your headings and body text. Choosing a font has never been so easy, or fun! Fearless has been designed from the ground up with translation in mind. It comes pre-packaged with a .po file containing all of the theme’s text strings, ready for translation. In addition, it’s compatible with the most popular internationalization plugins such as WPML. Fearless is built on top of the Hybrid Core theme framework by Justin Tadlock, one of the most respected minds in the WordPress community, so you know Fearless is built on a rock-solid base. Fearless is fully compatible with BBPress, so you can set up your own forum community on your site if you wish. Fearless has been designed from the ground up to be as easy-to-use as possible. No longer will you need to learn a confusing, proprietary interface to build custom layouts, just drag-and-drop! You’ll love Fearless’s sensible, easy-to-understand theme options panel, which works and looks just like the rest of WordPress. Finally, we’ve gone over every theme option and considered how we can make it easier to understand and use. Spend less time fighting with your theme, and more time doing something you really enjoy! Fearless has been designed to work perfectly with your existing content and images, taking care to follow WordPress standards for coding and CSS. If you already have content on your site, there’s no need to go through and update each post manually in order to enable certain theme features such as responsive images. In addition to the dead-simple setup process and easy-to-use theme options panel, we have a comprehensive documentation file included in the theme download. Finally, we take support very seriously. Your satisfaction is our #1 concern, so you can be sure you’ll be well taken care of. All images used in the live preview are licensed under Creative Commons, and are credited on the demo page where they are used. Images used in the live preview are not included in the theme download. 1.7.6 – Update widget constructors to fix PHP warnings. 1.7.5 – Fixed issue with the saving of theme settings. 1.7.4 – Fixed issue when saving settings via the Customizer. 1.7.3 – Fixed issue with comment form button on WordPress 4.2; fixed deprecated function warning. 1.5 – Fixed a number of bugs, and made improvements and refinements to various parts of the theme. You will want to regenerate your thumbnails after this update, using the Regenerate Thumbnails plugin.